Thank you for choosing to sign-up with The Reading Warehouse! Please enter the email address that you most commonly use as we will be using it to validate your identity as well as for sending messages regarding your account. We ask for it twice to ensure accuracy! Please choose a password for your account, it must be at least 5 characters long and contain only letters and numbers. Passwords are case sensitive. You hereby agree that You are responsible for all actions taken under Your User Name and Password. Please remember it is Your responsibility to keep this data secure and You hereby agree that We are not liable for any loss or damage arising from Your failure to keep Your password secure. Further, You agree to immediately notify Us of any unauthorized use of Your password or any breach of security. We provide schools and teachers with a one stop source for books. 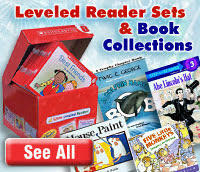 We have the lowest prices on school bulk book orders, and We will beat any legitimate book bid. Fax or email us your lowest book bid from one of our competitors and we will beat their price. No other book company offers this guarantee. Click Here for complete details. To place an immediate order, simply click on the product to view its description and click to add this item to Your shopping cart. Payment may be made online or by phone with a Discover, MasterCard, Visa or American Express credit card. You may also submit a purchase order or have Us produce a quote using our checkout pages. You may also fax Your order to Us at 866-546-2544. Our goal is to ship Your order in full as quickly as possible. All of Our products are usually in stock; however, occasionally a product that You order will be out of stock. In such cases, We will charge you for the items that are in stock and ship them out. When the back-ordered item becomes available, We will charge your credit card and ship it out. We are proud to offer Library Processing for Your school or library's order. We provide a link to Our Library Processing Quick Form on Our web site. When You have completely filled out the form, You will be allowed into our Library Processing area to begin selecting Your books and placing them in Your shopping cart. Note that Your Library Processing shopping cart is separate from the shopping cart attached to Your regular account. After We receive Your Quick Form, the approval process will take 7-10 business days. This is necessary to ensure that We have thoroughly inspected Your Quick Form and verified all the information contained in it. Once Your Library Processing Quick Form is approved, You will receive a notification e-mail message from Us telling You that You have been approved and that You may then begin placing Your actual orders. You may not 'checkout' an order until Your form has been approved. We use e-mail to keep You informed about the status of Your Library Processing orders. Whenever You place an order with Us, MARC records will automatically be selected for all of the titles You purchased. After Your order is complete You will receive an e-mail message from Us that Your MARC records are ready to download. Please review the Library Processing section on Our Web site to see current options and pricing for Your school or library's order. We are more than just a bookstore. We also offer a variety of DVD's and CD's, a Bargain Bin, Bargain Boxes, Foreign Language Materials, Small and Large Book Fairs in a Box and more on Our Web site. Simply click through to these pages on Our web site to learn more about and purchase these Other Products through our secure shopping cart. We Want To Help You Select The Right Product For Your Needs. If You need more information about a product, please contact Us by calling us toll free at 866-391-7323 or by using the live customer support chat feature found in the top right corner of every web site page. Before returning any merchandise, pleases contact us at: customerservice@thereadingwarehouse.com for detailed instructions. We can process returns and refunds only for items directly purchased from and fulfilled by Us. Returned items must be shipped prepaid and received in resalable condition. We will only accept returns on items shipped in error or damaged in transit. Returns must be returned within 15 days of receiving the item. If the wrong book was shipped in error the Shipping cost may be waived. On items of 2 to 19 units a 10% restocking fee may be deducted from the refund amount. In most cases, We will issue a refund in the same form of payment originally used. Bulk rate orders of 20 or more copies are not eligible for return. Due to our everyday discount and special pricing on bulk PO orders we cannot accept returns. All items purchased from The Reading Warehouse.com are made pursuant to a shipment contract. This means that the risk of loss and title for such items pass to you upon our delivery to the carrier. Any returns on a purchase order will cancel any Reading Rewards applied to that purchase order. We have a registered trademark in the name The Reading Warehouse and our logo. As indicated by the notice on the bottom of Our Home Page, We claim a copyright to the contents of this website. Identification of the copyrighted work claimed to have been infringed, or, if multiple copyrighted works at a single online site is covered by a single notification, a representative list of such works at that site. Information reasonably sufficient to permit the service provider to contact You, such as an address, telephone number, and, if available, an electronic mail address at which You may be contacted. We will inform the subscriber that they may submit a counter-notification regarding the claimed infringing material. The subscriber's name, address, and telephone number, and a statement that the subscriber consents to the jurisdiction of Federal District Court for the judicial district in which the subscriber’s address is located, or if the subscriber's address is outside of the United States, for any judicial district in which the service provider may be found, and that the subscriber will accept service of process from the person who provided the counter notification or an agent of such person. Upon receipt of a counter notification We will promptly provide the complaining party with a copy of the counter notification, and inform that person that We will replace the removed material and cease disabling access to it not less than 10, nor more than 14, business days following receipt of the counter notice, unless Our designated agent first receives notice from the person who submitted the notification that such person has filed an action seeking a court order to restrain the subscriber from engaging in infringing activity relating to the material on the service provider's system or network. 1. Use Our website to post, upload or transmit any content that is patently offensive, vulgar, unlawful, threatening, defamatory, abusive, tortuous, obscene, libelous, illegal, hateful, harmful, harasses or advocates harassment of another person, invasive of another person’s privacy, exploitive of people in a sexual or violent manner, racially, ethnically or otherwise objectionable or promotes racism, bigotry, hatred or physical harm of any kind against any group or individual. 3. Stalk or otherwise harass another; or harm a minor in any way. 4. Promote commercial activities and/or sales such as contests, sweepstakes, barter, or advertising except as provided by the functionality of the site. 5. Post, upload or transmit any unsolicited or unauthorized advertising, promotional materials, junk mail, spam, unsolicited mass mailing, chain letters, or pyramid schemes. 6. Promote an illegal or unauthorized copy of another person’s copyrighted work. 7. Upload, post, transmit or otherwise make available any material that contains software viruses or any other computer code, files or programs designed to interrupt, destroy or limit the functionality of any computer software or hardware or telecommunications equipment. 8. Use software that automatically creates user identities. 9. Intentionally or unintentionally violate any applicable local, state, national or international law. 10. Post inaccurate or misleading information. 11. Solicit money from any poster. You understand and agree that You are solely responsible for Your interactions with other visitors and that We reserve the right, but have no obligation, to monitor disputes between You and other visitors. Finally, We may delete data and posts which violate this Agreement; or delete data for any reason or for no reason based on Our sole discretion. OUR SERVICE IS PROVIDED ON AN "AS IS" AND "AS AVAILABLE" BASIS. YOU EXPRESSLY AGREE THAT USE OF ANY SERVICE OFFERED BY US IS AT YOUR SOLE RISK. TO THE FULLEST EXTENT PERMISSIBLE PURSUANT TO APPLICABLE LAW, WE DISCLAIM ALL WARRANTIES OF ANY KIND, WHETHER EXPRESS OR IMPLIED, INCLUDING WITHOUT LIMITATION ANY WARRANTY OF MERCHANTABLITY, FITNESS FOR A PARTICULAR PURPOSE OR NON-INFRINGEMENT. WE DO NOT MAKE ANY WARRANTY THAT OUR SERVICE WILL MEET YOUR REQUIREMENTS, OR THAT ANY SERVICE OFFERED BY US WILL BE UNINTERRUPTED, TIMELY, SECURE, OR ERROR FREE, OR THAT DEFECTS, IF ANY, WILL BE CORRECTED; NOR DO WE MAKE ANY WARRANTY AS TO THE RESULTS THAT MAY BE OBTAINED FROM THE USE OF ANY SERVICE OFFERED BY US OR AS TO THE ACCURACY OR RELIABILITY OF ANY INFORMATION OBTAINED THROUGH ANY SERVICE OFFERED BY US. YOU UNDERSTAND AND AGREE THAT ANY MATERIAL AND/OR DATA DOWNLOADED OR OTHERWISE OBTAINED THROUGH THE USE OF ANY SERVICE OFFERED BY US IS AT YOUR OWN DISCRETION AND RISK, AND THAT YOU WILL BE SOLELY RESPONSIBLE FOR ANY DAMAGE TO YOUR COMPUTER SYSTEM OR LOSS OF DATA THAT RESULTS FROM THE DOWNLOAD OF SUCH MATERIAL AND/OR DATA. WE DO NOT MAKE ANY WARRANTY REGARDING ANY GOODS OR SERVICES PURCHASED OR OBTAINED THROUGH US OR FROM ANY SERVICE OFFERED BY US OR ANY TRANSACTIONS ENTERED INTO BY USE OF OR THROUGH ANY SERVICE OFFERED BY US. NO ADVICE OR INFORMATION, WHETHER ORAL OR WRITTEN, OBTAINED BY YOU FROM US, OR THROUGH ANY SERVICE OFFERED BY US, SHALL CREATE ANY WARRANTY NOT EXPRESSLY MADE HEREIN. SOME JURISDICTIONS DO NOT ALLOW THE EXCLUSION OF CERTAIN WARRANTIES, SO SOME OF THE ABOVE EXCLUSIONS MAY NOT APPLY TO YOU. UNDER NO CIRCUMSTANCES, INCLUDING, WITHOUT LIMITATION, NEGLIGENCE, SHALL WE OR OUR PARENTS, SUBSIDIARIES, AFFILIATES, OFFICERS, DIRECTORS, EMPLOYEES, AGENTS, OR SUPPLIERS BE LIABLE FOR ANY DIRECT, INDIRECT, INCIDENTAL, SPECIAL, OR CONSEQUENTIAL DAMAGES, INCLUDING BUT NOT LIMITED TO PHYSICAL INJURY OR DEATH, RESULTING FROM THE USE OR THE INABILITY TO USE ANY SERVICE OR GOODS OFFERED BY US, OR FOR THE COST OF PROCUREMENT OF SUBSTITUTE GOODS AND SERVICES, OR RESULTING FROM ANY GOODS OR SERVICES PURCHASED OR OBTAINED, OR MESSAGES RECEIVED, OR TRANSACTIONS ENTERED INTO BY MEANS OF OR THROUGH ANY SERVICE OFFERED BY US, OR RESULTING FROM UNAUTHORIZED ACCESS TO OR ALTERATION OF YOUR TRANSMISSIONS OR DATA, OR OTHER INFORMATION THAT IS SENT OR RECEIVED OR NOT SENT OR RECEIVED, INCLUDING BUT NOT LIMITED TO, DAMAGES FOR LOSS OF PROFITS, USE, DATA, OR OTHER INTANGIBLES, EVEN IF WE HAVE BEEN ADVISED OF THE POSSIBILITY OF SUCH DAMAGES. YOU ALSO AGREE THAT WE SHALL NOT BE RESPONSIBLE OR LIABLE TO YOU, OR TO ANYONE, FOR THE STATEMENTS OR CONDUCT OF ANY THIRD PARTY ON OR ARISING FROM USE OF ANY SERVICE OFFERED BY US. IF YOU ARE DISSATISFIED WITH ANY SERVICE OFFERED BY US YOUR EXCLUSIVE REMEDY IS TO DISCONTINUE USE OF THE SERVICE WITHOUT REFUND OF ANY KIND WHATSOEVER. We shall not be liable for delays or nonperformance of this Agreement caused by strike, fire or accidents, nor shall We be liable for delay or nonperformance caused by lack of availability of materials, fuel or utilities or for any other cause beyond Our control. You may not assign the rights or obligations under this Agreement. Our services are available and may only be used by individuals who are 18 years of age and older who can form legally binding contracts under applicable law. You represent and warrant that You are at least 18 years old and that all registration information You submit is accurate and truthful. You agree to comply with all local laws regarding online conduct and acceptable content. Except as modified or supplemented by a writing executed by both parties, the Terms and Conditions described herein are the only representations, warranties, and understandings between the Parties with respect to the products and/or services described herein. In the event of a dispute, You agree to attempt to resolve the dispute by contacting Us at customerservice@thereadingwarehouse.com prior to taking any other action. Failure to contact Us to attempt a dispute resolution prior to taking any other action will result in a breach of this Agreement by You. This Agreement and Your use of Our web site are governed by the laws of the State of South Carolina, and the courts of general jurisdiction located within Charleston County, South Carolina, will have exclusive jurisdiction over any and all disputes arising out of, relating to, or concerning this Agreement or any other controversy between You and Us. You hereby waive any right to a trial by jury in the event of any controversy or claim relating to this Agreement. In addition to the foregoing, in the event of any breach or violation of this Agreement, We shall be entitled to enforce all of Our legal remedies for the breach or wrongful activity including, but not limited to, seeking actual damages, the maximum amount of statutory damages under applicable statutes and Acts, profits, treble damages, and attorneys’ fees and costs. These remedies and damages are in addition to the monetary payments described above and/or any amounts otherwise due under this Agreement. If any provision, or portion thereof, of this Agreement is held by a court of competent jurisdiction to be invalid under any applicable statute or rule of law, You and We agree that such invalidity shall not affect the validity of the remaining portions of this Agreement and further agree to substitute for the invalid provision a valid provision which most closely approximates the intent and economic effect of the invalid provisions. This Agreement is effective as of August 24, 2017. We reserve the right to revise this policy from time to time without prior notice. You will be notified of any material changes in Our Terms of Service either by email or by a conspicuous posting on Our Web site. Welcome to the website of The Reading Warehouse, Inc., located at thereadingwarehouse.com (hereinafter “We”, “Us”, “Our”). We thank You (any visitor to Our web site and hereinafter "You" or "Your") for visiting Our site and considering Our products and services. The Personal Information We may collect and store is the information that You voluntarily disclose to Us, including but not limited to; any information that identifies, relates to, describes, or is capable of being associated with, a particular individual, such as: (1) first and last name; (2) home or other physical address, including street name and name of a city or town; (3) email address; (4) telephone number; (5) a government issued identifier; (6) biometric Identifiers (e.g. fingerprint or eye scan); (7) any other identifier that permits the physical or online contacting of a specific individual; or (8) information concerning a user that the web site or online service collects online from the user and maintains in personally identifiable form in combination with an identifier described in this subdivision. Personal Information does not include publicly available information that is lawfully made available to the general public from federal, state, or local government records. We store Your Personal Information on Our computers, and We believe We have reasonable security measures in place to protect Your Personal Information including encryption of any personally identifying information. However, We cannot guarantee that Our security measures will prevent Our computers from being accessed without authorization and Your Personal Information stored on them stolen, deleted or changed. We assume no responsibility for such unauthorized actions. For any unencrypted data that We maintain that includes Personal Information, We will notify You of any unencrypted Personal Information that was, or is reasonably believed to have been, acquired by an unauthorized person. The type of information that triggers the notice requirement is an individual's name plus one or more of the following: Social Security number, driver's license or a government issued identifier, financial account numbers, medical information or health insurance information, as well as any complete login information. We may use Your Personal Information for any legal purpose in Our sole discretion, including but not limited to; membership, registration, log-in, or order fulfillment purposes. You hereby agree that We may also use Your Personal Information to contact You by phone, U.S. mail or email. You hereby agree that We may transfer Personal Information to third parties for order fulfillment, to respond to Legal Processes or governmental requests for information, or for any other legal purpose. While Your browser may contain a “do not track” signal or other mechanism that provides You the ability to exercise choice regarding the collection of personally identifiable information or about Your Internet activities over time and across third-party sites or online services, Our systems are not set up to accommodate Your browser’s request.